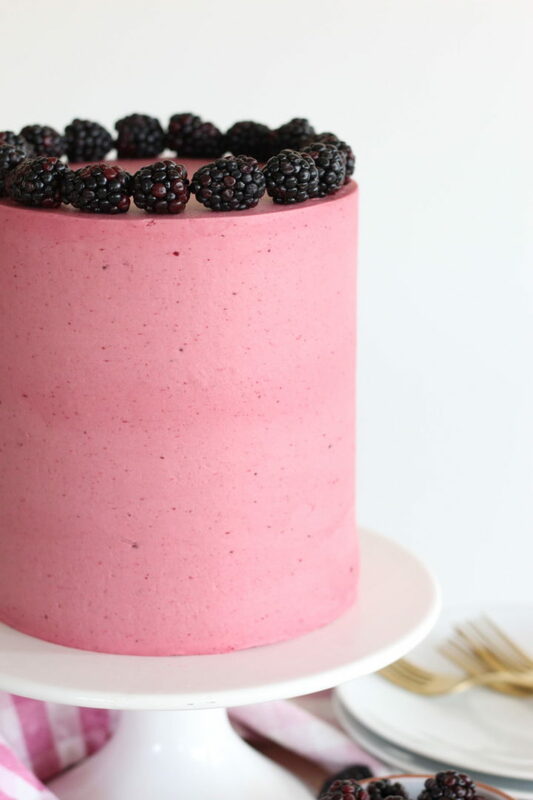 Chocolate Blackberry Cake – Dark chocolate cake layers with blackberry compote and blackberry buttercream. 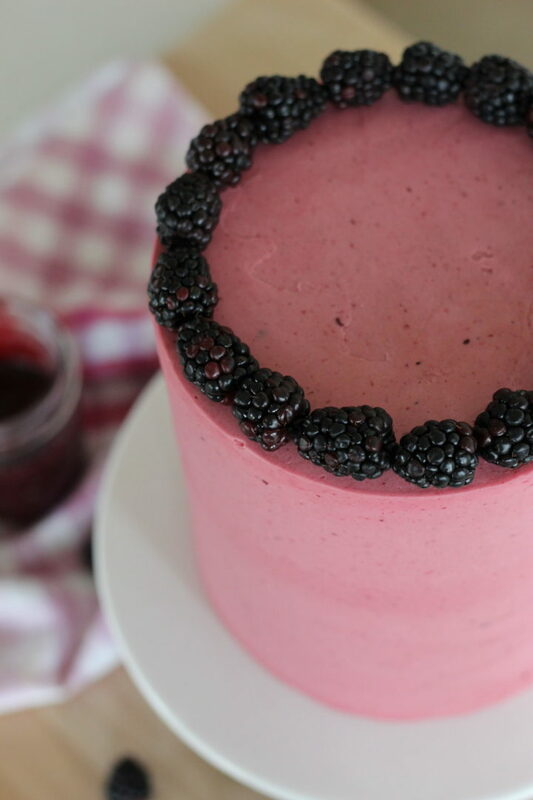 I’ve been wanting to make a blackberry buttercream for the longest time! 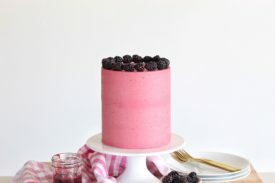 My Gluten Free Cake with Mixed Berry Compote and Buttercream is one of my all-time favorite cakes. I knew the format for the compote and frosting would work great with blackberries but I thought the cakes would be too similar if I did a vanilla cake with the blackberry buttercream. Instead, I went the route of my Dark Chocolate Strawberry Truffle Cake and made my favorite chocolate cake layers. The pairing of the sweet blackberry buttercream with the bittersweet chocolate cake layers is so decadent! You’ll see below that these chocolate cake layers turned out extra fudgy. I think this happened because I used new bake even strips. They did help my cakes to bake a little more flat, but it took an extra 10 minutes to bake and they turned out more brownie-like. Not sure I’ll sue them again on this particular chocolate cake recipe. 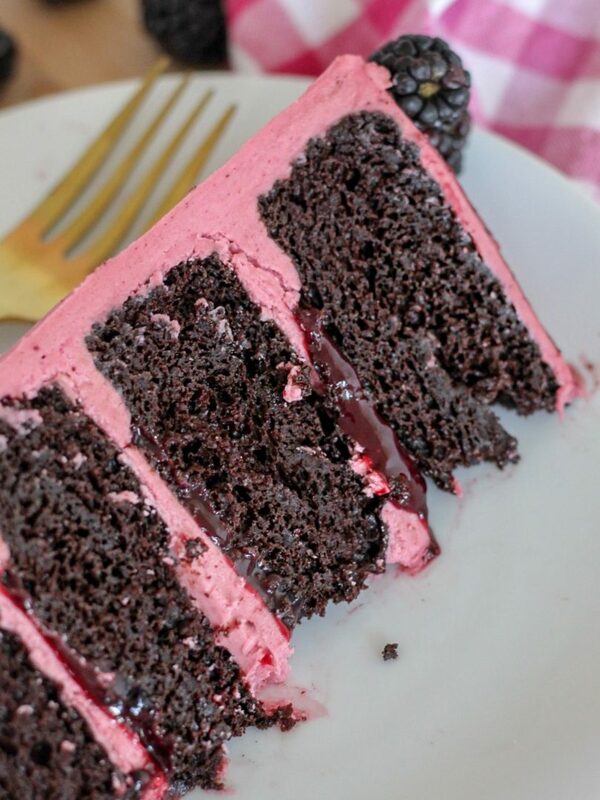 Dark chocolate cake layers with blackberry compote and blackberry buttercream. Preheat the oven to 350 degrees F. Spray four 6-inch pans or three 8-inch round cake pans with nonstick spray. Line the bottom of each pan with parchment paper, then spray the pans again. Pour the batter into the prepared pans and bake for 16-18 minutes. Wrap in plastic wrap and chill until ready to use. You're still going to want to level your cake layers to ensure a completely even surface for frosting and stacking. Combine the blackberries and sugar in a medium saucepan over medium heat. Stir the mixture while bringing it to a boil and occasionally breaking up the berries to release their juices. Strain 1/2 cup of the mixture and reserve for frosting. Refrigerate the strained blackberry mixture and the remaining compote for at least 4 hours before using. With the mixer on low speed, slowly add the powdered sugar, followed by the blackberry juice, heavy cream, vanilla extract and dash of salt. Before frosting your cake, mix the frosting by hand with a wooden spoon to push out the air pockets. This will also help the frosting pull back together if it looks separated from adding the blackberry juices. Spread a dollop of frosting on a cake board or cake plate to hold the first cake layer in place. Place the first cake layer, top side up, on the cake board and pipe a rim of blackberry frosting around the edges to act as a barrier to the compote. For the 6-inch round cake, spread about 1/4 cup blackberry compote on the cake layer. For an 8-inch cake, spread 1/2 cup blackberry compote on the cake layer. Top with the next cake layer and repeat step 2. Place the final cake layer top side down. Apply a thin layer of frosting around the entire cake to lock in the crumbs. Freeze the cake for about 10 to 15 minutes to set the crumb coat. If your frosting feels soft at this point, refrigerate it while the crumb coat sets. Continue frosting your cake, making sure to stir the frosting with a wooden spoon to push out any air pockets. If you're not serving within the day, you can freeze the cake in a cake box or container for up to a week - just make sure to remove the cake from the freezer about 6 hours before you plan to serve it. I do it so the filling doesn’t seep into my cake layers. I want it to be it’s own layer in the cake. If you pipe rim around the edge of the cake before placing a second cake layer on top, it will help prevent it from sliding around.